Applications are invited only through online mode from eligible candidates up to 11.59 P.M on 30.05.2017 for the Direct Recruitment for the post of Post Graduate Assistants / Physical Education Directors Grade-I in School Education and other departments for the year 2016-2017.
a. The candidates have to pay a fees of Rs.500/- (Rs.250/- for SC/ST and differently abled candidates) towards examination fee payable only through online net banking /credit card / debit card. 2. Evidence for claims made by the candidate while applying online should be submitted by the candidate at the time of Certificate Verification, if called for. The Selection will be made in two successive stages viz., 1) Written examination 2) Awarding weightage marks during Certificate Verification. The Written Competitive Examination will be held on 02.07.2017 from 10.00 A.M to 1.00 P.M. The venue for the Examination will be intimated in the Hall Ticket. The Hall Tickets for the eligible candidates will be uploaded by the TRB in its official website. The candidates are advised to refer the TRB website for details (http://www.trb.tn.nic.in). No written communication will be sent to the candidate. 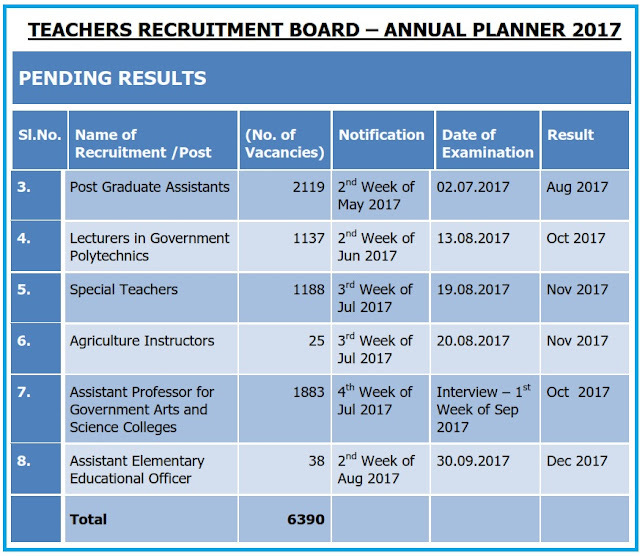 Teacher Recruitment Board (TRB) Published today (18.04.2017) The Annual TRB Recruitment Planner for the year 2017. The Total Vacancies will be 6390 Teacher Posts. Candidates should possess M.A./M.Sc./M.Com. in the relevant subject with B.Ed., in 10+2+3+2+1 or 10+3+3+2+1 pattern and all the certificates regarding educational qualifications should have been issued prior to the last date for submission of filled-in Application announced in the recruitment notification published. a. The Application Form (OMR format) along with Prospectus can be purchased in person from the Office of the Chief Educational Officers of all 32 Districts in Tamilnadu on payment of Rs.50/- (Rupees fifty only) in cash towards the cost of the Application Form and Prospectus. b. Submission of Filled-in Application Forms: Candidates are advised to submit the filled-in forms at the Office of the Chief Educational Officer concerned, and obtain acknowledgement for the same. The candidates are requested to pay the examination fees Rs.500/- (Rs.250/- for SC/ST and Differently Abled) in any Branch of STATE BANK OF INDIA / INDIAN OVERSEAS BANK / INDIAN BANK using only the prescribed challan attached with the prospectus. The written examination will consist of a Single paper of 3 hours duration with 150 MCQ’s each question carries one marks.